Written by Will on October 29, 2012 and posted in Reviews and Opinions. The Master Chief and Cortana have been adrift on the UNSC Forward Unto Dawn for over 4 years. The Chief has been in chryosleep for much, if not all, of that time. Upon John’s awakening by Cortana he discovers they are beside the planet Requiem and being drawn in – interestingly this is the planet seen in the Legendary ending for Halo 3. Cortana informs him that the ship has been boarded and while investigating the ship it crashes down on Requiem. On the planet, Requiem, you discover a new – terrifying – enemy and unearth a revelation of the past about the age of the Forerunner-Human war while you witness, first hand, the accumulated damage done to an AI approaching the end of it’s useful lifecycle – even one as unique as Cortana. 9/10 for visuals. 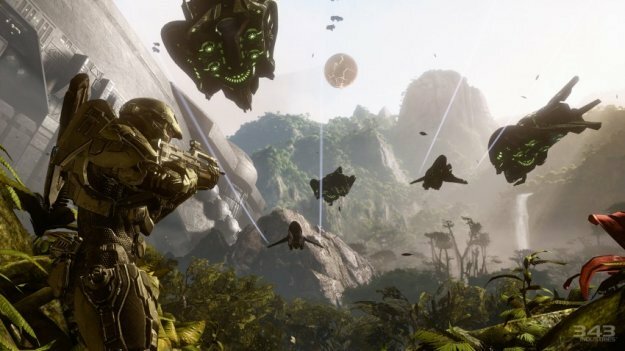 It looses a point for only one reason – it’s not completely photo realistic.It is, however, still top notch, if you think along the lines of the graphical levels that Crysis sets the standard of then your on the right track. 343i have certainly not disappointed on the graphical front – Halo 4 is easily a few steps up from Reach and Combat Evolved Anniversary. The blue hue surrounding Master Chief on the Halo 4 cover felt to me like it echoed through to the in-game lighting in a way that was very sharp and vibrant while retaining that halo-esque feel – an almost perfect scene-setter for the beginning of the Reclaimer Trilogy. The visual differences between items in the game are nice and defined – for instance: the piles of weapons amassed from clearing rooms can be more easily distinguished from one and other than in previous Halo games. The environment and architecture in the game feels authentic. It is different and unique in it’s own right but they’ve still managed to keep it in-theme well and it fits perfectly within the current Halo Universe. Here’s a screenshot to show you just how crisp and defined the graphics are. This is taken directly from a saved video in someone’s fileshare that was recorded in a multiplayer match. It is not cut scene graphics, its in-game. This looks awesome doesn’t it? There’s both new and old weapons in Halo 4. One thing I (and others) noticed early on was that the weapons could do with a higher ammo carry limit. This minor issue spread through the Human, Covenant and Promethean weapons with the Needler only allowing you to carry 2 additional clips! One person pointed out that this could be a subtle nudge on 343’s part to encourage co-op play. The low ammo amounts prove particularly problematic on Heroic and Legendary when dealing with multiple vehicles – as some of the more commonly dropped weapons do little to no damage against those. You try taking down all these guys with energy weapons. In Halo 4 there’s the good old marines but there’s also a whole new wave of Spartans on the Human side – The Spartan IVs. 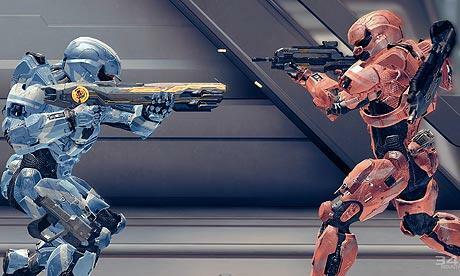 You play as the Spartan IV’s in the multiplayer “War Games”. War Games takes place aboard the UNSC Infinity. It is a training simulator for the Spartan IVs to be trained and to keep their skills sharp. You also play as a group of Spartan IVs in the Spartan Ops episodes. 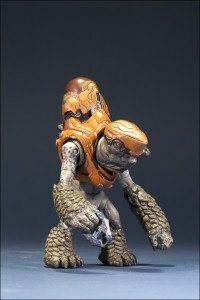 There’s no new species in the Covenant however there are a much larger verity of grunts that are much more common than any of the other games. The Elites are now slightly smarter and I noticed that Elites with shields would run in front of other Elites that I had just taken down. Whether that was just coincidence or to protect the elite without a shield – I don’t know – bit I did notice it happen on at least 4 occasions through the campaign. The Prometheans introduce 3 new enemy types to the game each one very different. They are called Promethean Knights, Crawlers and Watchers. Each one has an equivalent Covenant counter part bar maybe the Watchers. There are 4 variants of Promethean Knight. Knight Battlewagon – these are the heavy weapon carriers. It has been noticed by some that there are blue and red verities of Promethean. It was suggested that they were blue at day and red at night but that is not quite true. When you first encounter them they are blue but a little into the game when you encounter the Diadact he takes control and orders them to attack you. That is the point which they change from Red to Blue. Master Chief is back as the main character and Frank O’Conner said they would be letting you see more of his human side, more of his Spartan super soldier skills and more of his overall superhero-y-ness. Personally I feel that although he speaks much more in the game than in any other and he does actually show his feelings at certain points they haven’t quite followed through on their promise (or at least the image I had built up in my head lol).